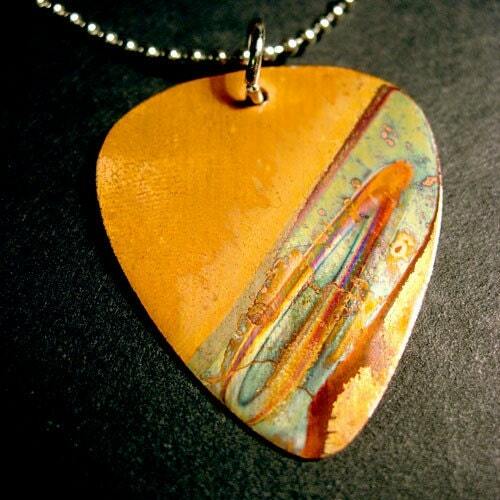 Kahla of Heavy Metal Picks makes one-of-a-kind guitar pick accessories out of copper and steel. 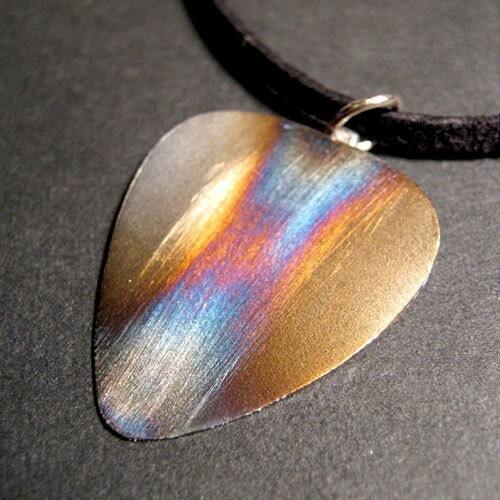 Each one is handcrafted from plain sheet metal that's been heated to have unique swirls of iridescent color. Some are finished off with crystals, metal studs, rings, or custom printed designs. She also does limited edition band merch, and currently has custom necklaces on the merch tables of L.A. Guns and Triple Cobra with more to come throughout the summer. New bands are always announced via the Heavy Metal Picks facebook page, linked from the HMP website. Tell me about how you originally got into your craft, Kahla. I'm originally a painter - I went to art school for fine art and graduated in 2009. My senior year show featured a series of oil paintings that were portraits of some of my favorite glam rock friends from Hollywood; Vains of Jenna , the sunset striplets, etc. For the backgrounds I used pieces of sheet metal that I'd heated to have colorful abstract patterns, and I really loved the effect. It was cool to see how each piece turned out, and the colors were so bright and iridescent. 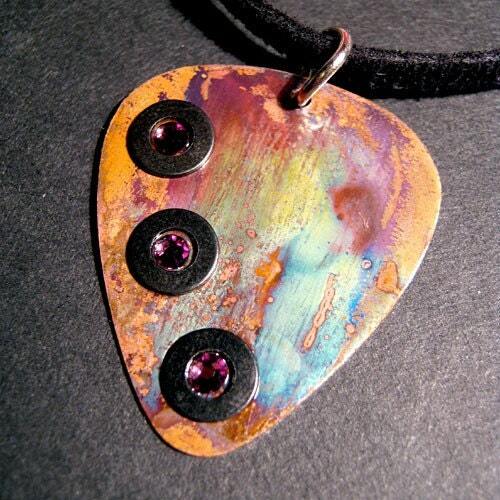 Just for fun I made a necklace for myself by cutting a piece of the copper into a guitar pick, and it took off from there. I started making more, people liked them, and I started offering them for sale. Going to concerts, definitely. I'd rather go see my favorite band play than just about anything. I've always tried to combine my art with my true passion, which is music. Unfortunately I'm a terrible musician and worse songwriter, so I do what I can to contribute. I love making posters and album covers and things like that, and now the jewelry is another part. I suppose promoting. On the one hand I have a built in audience in the music scene, I know exactly who likes my necklaces and where to find them. But I'm terrible at promoting to my friends. It's much easier to throw a pick around the neck of a gorgeous singer and let him be a pretty walking billboard. That's my next goal, to push Heavy Metal Picks beyond Hollywood and the Sunset Strip. My personal favorite actually just sold, but of the necklaces currently listed, this is probably the one I'd want most. I'm never sure what's going to happen while making the picks, and sometimes it's a complete surprise. I still haven't come close to making another one like that yet. Definitely not an artist running around Hollywood making merch for some of my all time favorite bands! I never ever considered being an artist or going to art school. For being a creative "artsy" person, I'm actually extremely practical, and art just wasn't something I thought of as a real job. Doctor, lawyer, something like that with a nice paycheck. I don't recall ever having a concrete goal, probably because the only thing I really enjoyed doing was my hobby. But then I was 18 and said ya know what, I don't wanna sit around in Oregon reading law books and being bored to tears, I'm gonna move to LA and give it a shot. I really adore Austin Young, the photographer. He does such an amazing job capturing some awesome crazy characters. And I'm a sucker for leather, so I covet everything in Unearthed's shop. No clue! But if you'd talked to me this time last year - as I was scrambling to finish my senior show of paintings and thinking about gallery shows and artist statements - and told me that in the next year I'd be making band merch full time and working with L.A. Guns ? Never would've believed it. At this point I'm just pushing steadily forward, working to get Heavy Metal Picks into some retail shops and making plans with lots more bands to create custom lines for them. Ultimately I hope to expand HMP beyond my apartment and beyond Hollywood. And pay off those student loans.